Obituary for William James "Jim" North Jr.
William James “Jim” North, Jr, 82, of Marietta, was comforted by his family and caregivers, as he was promoted to glory on Wednesday, April 19, 2017 at Marietta Center in Marietta, Ohio. He was born on December 7, 1934 in Upland, PA, to Thelma Tanley and William James North, Sr.
Jim graduated from The Salvation Army Training College in New York City in 1957. He married fellow Salvationist, Lois Jean Rought, on June 21, 1958. Together they served 20 years of ministry, including a five year term as missionaries in East Africa. Jim retired from Peoples Bank where he enjoyed a career as a teller. He was known throughout the Marietta church community. Jim was a member of the First Baptist Church in Marietta and more recently a member of the First Presbyterian Church in Marietta. Jim loved the Lord, he proudly sang and played trombone in The Salvation Army Staff Band, shared in music ministry, Bible study, and fellowship with others. 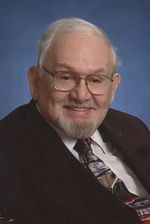 He is survived by four daughters, Brenda North of Marietta, Beth Sour (Peter) of Marietta, Barbara North-Moss (Eric Moss) of Athens, Ohio, and Beverly North-Garvin (James Garvin) of Cincinnati, Ohio; and five grandchildren, Carolyn Sour, William McAtee, Jr, Gwendolyn Sour, William W. Garvin and Aidan Garvin. Jim was preceded in death by his parents, his wife Lois Rought North, and sister, Nancy North. The North Family would like to sincerely thank the staff of Interim Health Care, Marietta Center, and Amedisys Hospice for the compassionate care they provided to Jim. To send flowers to the family of William James "Jim" North Jr., please visit our Heartfelt Sympathies Store.